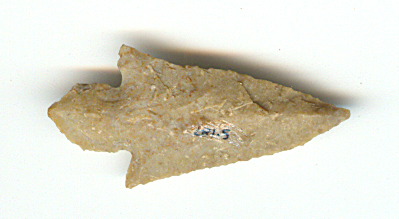 A Small Size, Very Well Made, Caddoan Hayes Arrow Point That Exhibits Surface Sheen And Stone Aging Coloration Patina, Aging At The Stem Notches, Aged Soil Deposits, Overall Surface Aging, Aged Mineral Deposits, Correct Type Of Material & Manufacture For The Area Found. Found At The Bowman Site In Little River County, Arkansas By Glen Kizza. Ex-Glen Kizza Cleatious Thomas And Aubrey Devault Collections. This Is A Highly Collectable, Caddo, Ceremonial Offering Arrowpoint! Includes A Ken Partain Certificate Of Authenticity!